A new highway bridge connects Pond Creek with US 460 at Draffin. 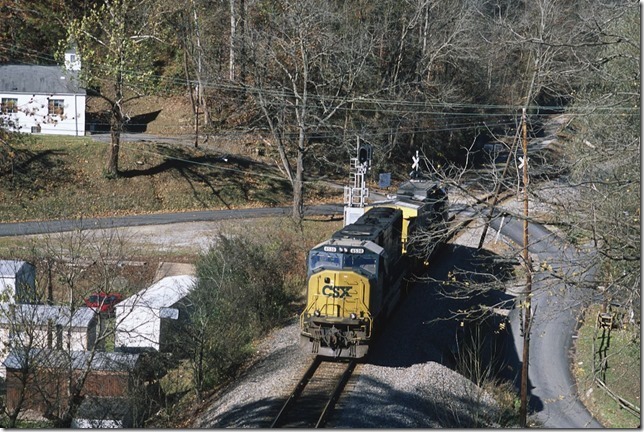 It offers new opportunities as far as railfan photography. I was spurred into action last fall when a contractor started installing “ghetto” wire. 1. 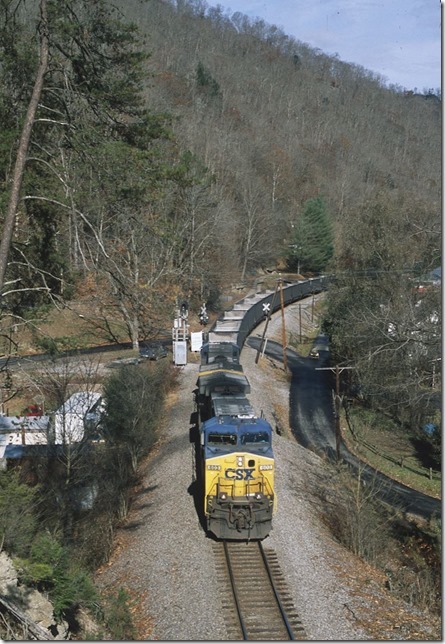 CSX 157-62 on northbound N339-02 with 110 TILX empties. 11-3-2013. 2. N339 looks at a green automatic block signal at Draffin. 3. CSX 167-4538 on N/B pusher F810-10 returning to Shelby after shoving a train to Dante. 11-10-2013. 4. 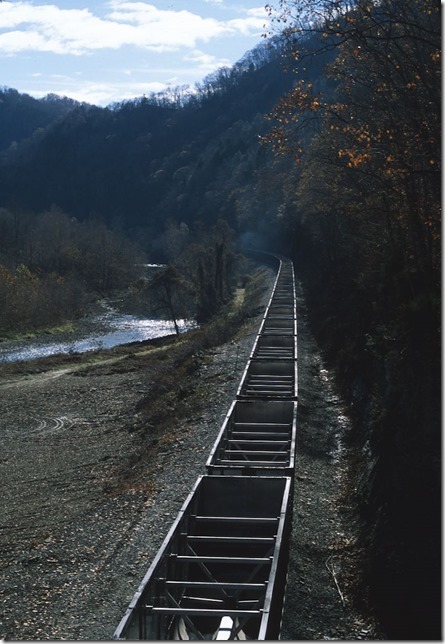 S/b F892-16 with 603-262 and 100 empty tubs for mine at McClure, Va. This is a Dante crew that was taxied to Shelby. 11-16-2013. 5. 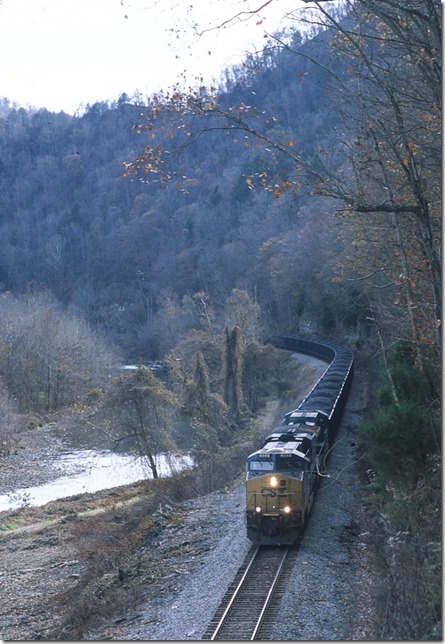 S/b F892-16 with 603-262 and 100 empty tubs for mine at McClure, Va. This is a Dante crew that was taxied to Shelby. 11-16-2013. View 2. 6. 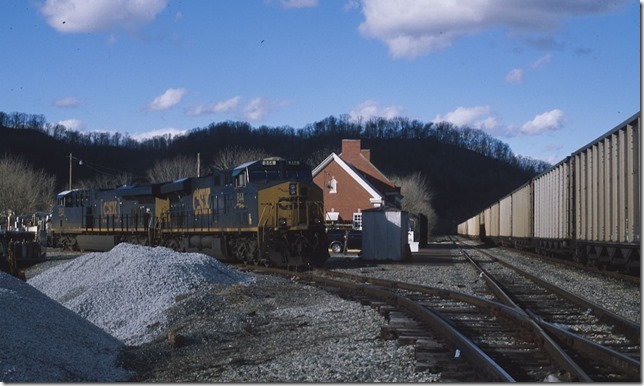 CSX 817 on N/B empty grain train G953-15. 11-16-2013. 7. 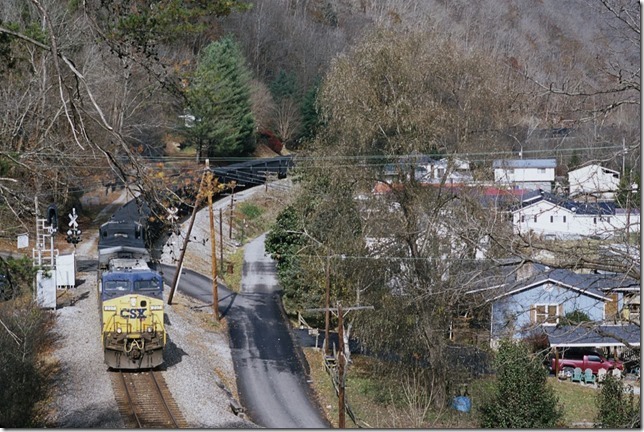 CSX 237-250 on S/B coal train U422-14 with system tubs. 11-16-2013. 8. Pusher 893-288 on S/B U422-14. 11-16-2013. 9. 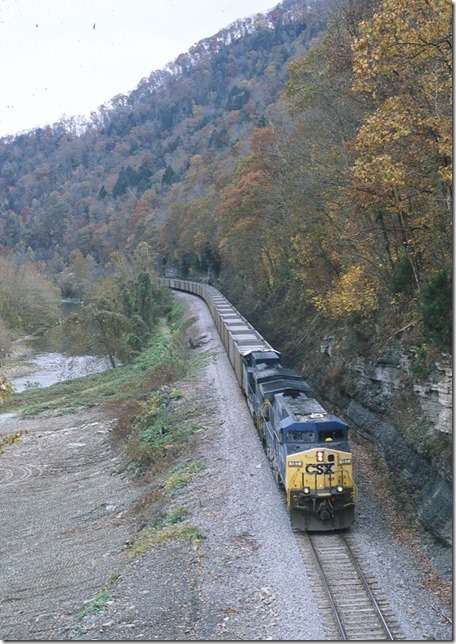 CSX 213-983 on E/B empty train N824-27 exiting Buffalo Tunnel near Thealka, Ky. 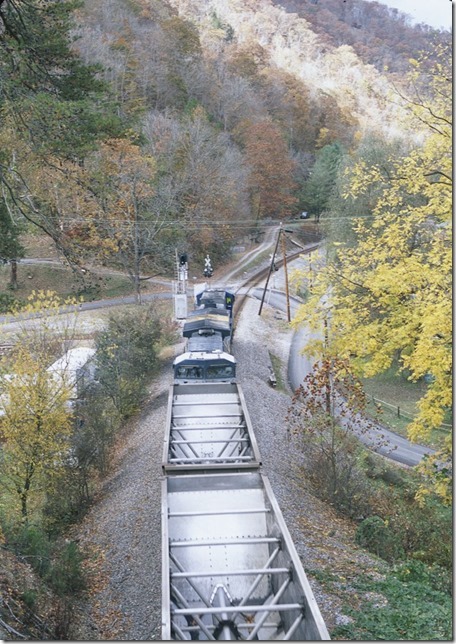 Train consists of KCLX, HEQX, MBKX, CEFX and SPSX equipment, but the DEEX cars indicate it is actually a Detroit Edison train. 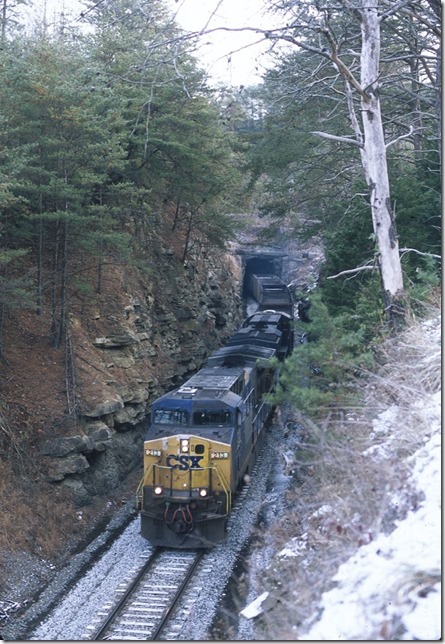 This is the only remaining tunnel on the Big Sandy main line. 11-30-2013. 10. 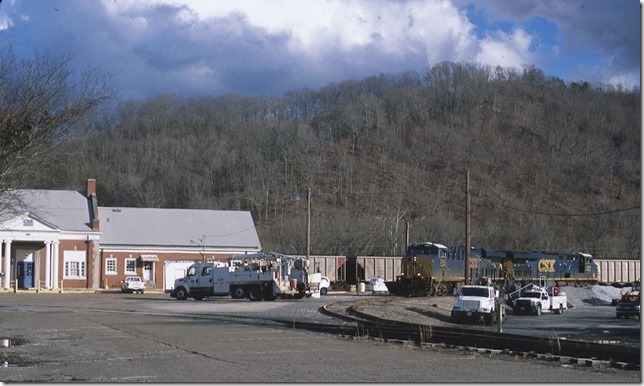 CSX 3043-844 are parked on the east leg of the wye at the former Paintsville depot. 1-11-2014. 11. 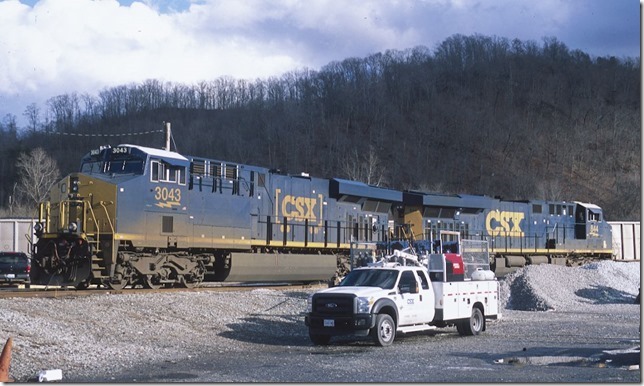 CSX 3043-844 are parked on the east leg of the wye at the former Paintsville depot. 1-11-2014. View 2. 12. 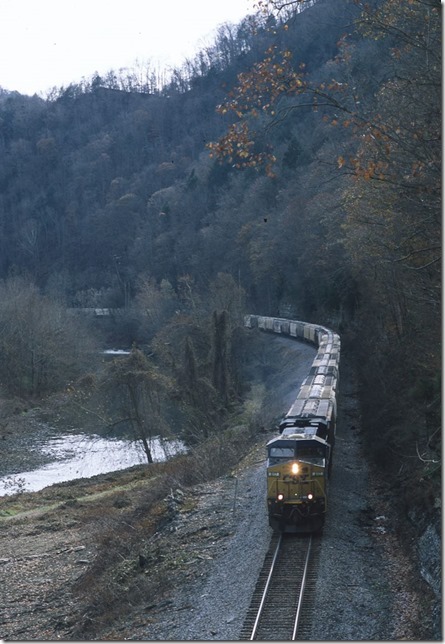 The track in the foreground was formerly (before 1983) the main line. Now the main line skirts the east side of the yard, and this is called the “ID” track.